Not even the late, great Origin godfather Arthur Beetson would have dared to think it possible… Even those with maroon coursing through their veins would once have thought the eight consecutive series wins witnessed was the stuff of State of Origin dreams. Under the guidance of one-time playing great Mal Meninga, the Maroons took the field with the confidence they were capable of victory from any point in a game, no matter how irretrievable the situation appeared. Meninga instilled in his charges an unwavering self-belief – and under the heat of battle, he could have had no better on-field generals to reinforce his message than his successive skippers Darren Lockyer and Cameron Smith, two of the game’s all-time players, as well as leaders. To celebrate his unrivalled representative career, Official Memorabilia have gone to the vault to deliver something special. In conjunction with the NRL and QRL, Official Memorabilia are proud to offer Eight Straight – our first official Artisan Release. 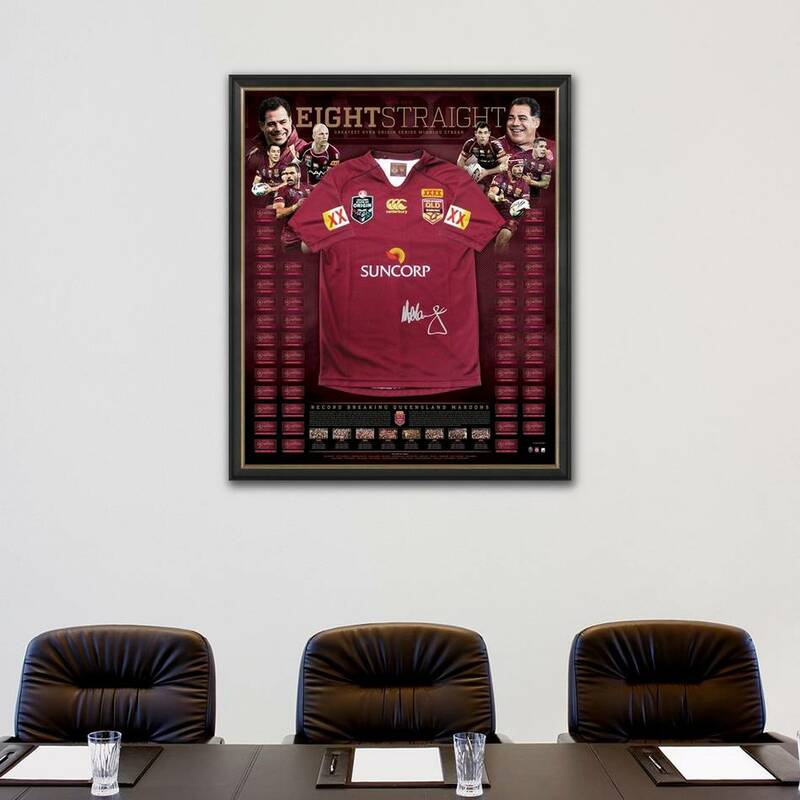 This magnificent deluxe jersey display comes personally signed by no less than 49 players – including retiring hero Cam Smith – from the eight consecutive series victories, and comes officially licensed by the NRL for your peace of mind. 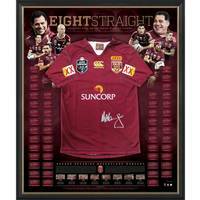 Strictly limited to just 10 editions, Eight Straight is a must-have for all Maroons fans and astute collectors alike. Secure yours now to avoid disappointment, as this limited release will not last long.